tap the first cask of Five Seasons Festbier. 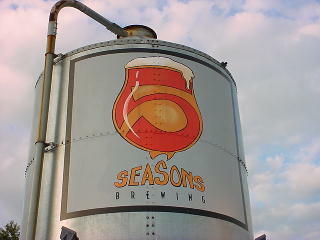 Five Seasons is open in the spot of the original Phoenix Brewing Company in the Prado shopping center on Roswell Road at I-285. 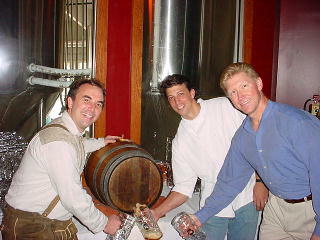 It produces some wonderful lagers and ales along with delicious menu items. The brewpub was decorated in the traditional white and blue of Munich's Oktoberfest. Inside the front door to the left is a bar area with pool and darts and another bar and dining room area to the right with a large patio. 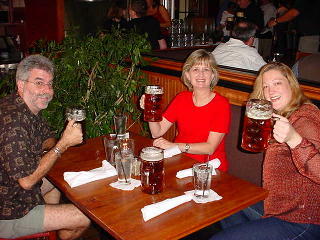 Here are Dean, Gail, and Kerri hoisting liters of the Oktoberfest beer at Five Seasons. It's not as hard as you might imagine to put away a couple of liters of this lager that offers rich flavors of malt, toast, caramel, and toffee. 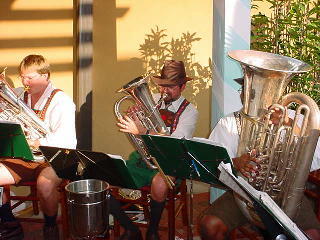 Music at the Five Season's event consisted of a four piece "oompah" band. The band offered traditional, bucolic entertainment to the partying crowd. 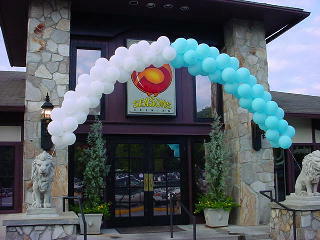 We love the outdoor patio at Five Seasons. 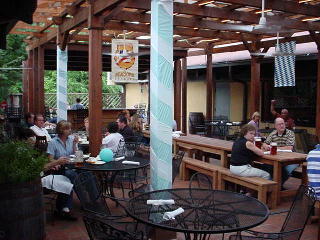 In the warmer months of the year it offers a relaxing atmosphere in which to consume great food and beer. During the Oktoberfest event, it made a wonderful biergarten. 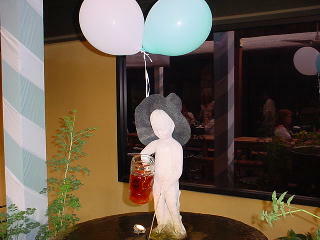 The Five Seasons patio even has a reproduction of the famous Brussels, Belgium statue of Mannekin Pis. This little urinating boy is a much loved symbol in Belgium, and he was appropriately decked out for Oktoberfest at Five Seasons.